How cool would it be to build your own solar car? That’s what my husband Kelly Hart thought, over ten years ago. He was following all the solar car news, and he noticed that all the attention seemed to be going into racing vehicles. He thought a slower moving, reliable neighborhood vehicle would be very useful. So he built one, with some help from me, and we called it our Sunmobile. We used it to drive around our small Colorado town. We even took it in the 4th of July parade one year! How did we create this unusual thing? 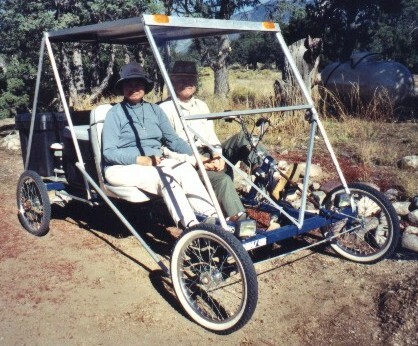 We began by buying the framework, a very sturdy four-person bicycle called a Rhoades Car. We kept one set of pedals, so the driver could pedal if needed. We would have kept the one on the left as well, but Kelly’s design needed that space for some of the parts. We joked that we had a hybrid vehicle: solar and human powered! He built an aluminum canopy which acted as a sun shade and more importantly as the location for the solar panels. He installed a box that went behind the two seats, to hold a set of four deep-cycle marine batteries, and then behind it he installed a large black cargo box. It held our groceries, the mail, and whatever else we wanted to carry with us on our short trips. The vehicle used a one horsepower motor that Kelly installed. The brakes were hand brakes on the handlebars. We also had a speedometer, a rear-view mirror, a loud horn, and headlights. We were not required to license it. We never plugged the Sunmobile in to the power grid, though that could have been done. We were strictly solar, other than a bit of pedaling! The vehicle could go up to 30 miles an hour, and had a range of up to 30 miles, though I don’t think we ever went quite that far. But in the several years we operated our Sunmobile, we must have gone hundreds of miles. We loved the pollution-free nature of the vehicle. Kelly often drove the Sunmobile into town to get the mail. I became used to his not returning promptly. Once in a while the vehicle would break down, but much more often people asked Kelly a lot of questions about it. He gave many rides to fascinated passengers! We no longer own the car. It happened to be down for repairs when we decided to sell our home and move to Mexico. The friends who bought our house wanted the car as well, so we included it in the deal. We lived in Mexico for about five years and then we moved back to the same little town in Colorado. People still keep coming up to Kelly around town and asking him about the Sunmobile. Maybe one day such vehicles will be commonplace.